Honored as the Outstanding Young Choral Conductor of the Year in 1993 by the Kansas Choral Directors Association, Resseguie has directed numerous All-District choral festivals at elementary, junior-high and high school levels. 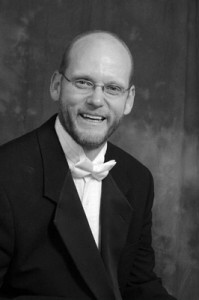 He has served as the R & S Men’s Choir Chair for the Southwest American Choral Director’s Association, and has chaired the Northeast District KMEA, and state ACDA boards. he completed his graduate work at the University of Kansas, where he holds a Masters in Music Ed choral Pedagogy. He served as the choral coordinator and a clinician for the KU Midwestern Music Camp from 93 until 2006, and is also the Minister of Music at the First Presbyterian Church in Lawrence. He is married to Holly Resseguie, and he has four wonderful children: Jamie, Kirk, Kyle, and Kara.